It's been a while since our sixth update and there's quite some stuff to talk about! First of all, sorry for the delay in the update, it's overdue by almost two weeks. Second of all, if you missed our lima update, make sure to check that out! There will be a lightning talk about Maemo Leste at FOSDEM 2019 - we will try our best to bring a couple of demo devices and show off Maemo Leste after the lightning talk! The Pine64 community will have a stand at FOSDEM, where they will show their prototypes of the PineTablet and PinePhone - they might even be able to show off Maemo Leste running on their prototypes. Necunos NC_1 and NE_1 has launched, and can be ordered with Maemo Leste preinstalled - at least, if we manage to have a usable image by the time they plan to ship the devices - we don't have Maemo Leste running on their device yet. Necunos has told us that we will probably get a Necunos development kit at FOSDEM. And the aarch64 packages are confirmed to also work on other devices - like the Pine64 Anakin Devkit! The Linux kernel developers (little elves) have been working hard on improving modem support for the Motorola Droid 4, which should make ofono and/or modemmanager integration way easier, which is good news! We're tracking ofono support for the Droid 4 in this issue. And they also report that during idle the phone battery life might be almost 5 days. PowerVR support for the Droid 4 should make the device quite usable, so that should perhaps soon become a priority. We have a couple of spare Droid 4 devices now, so if you're a capable developer and want to help out with kernel or userspace development, but don't have a device, we can perhaps arrange to get you one. spinal84 and freemangordon have made some great progress towards making Maemo Leste on the N900 feel more like Maemo Fremantle - in a good way. Graphics are more smooth, charging detection responds almost instantaneously now, and the RGB led works like you're used to in Fremantle. 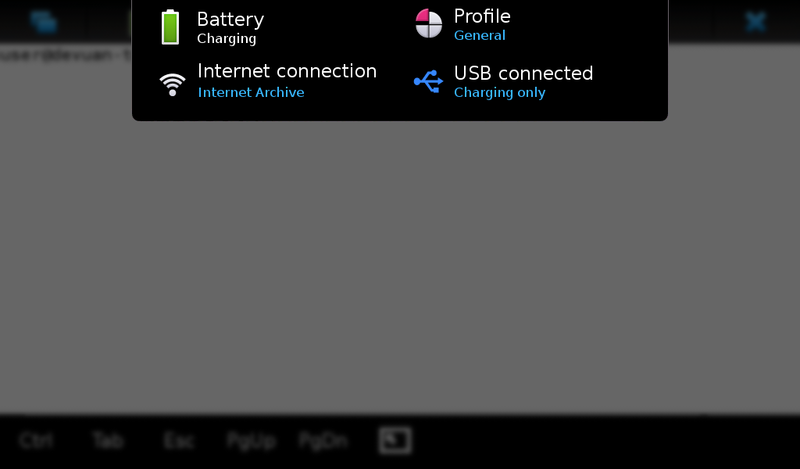 This mce pull request makes the RGB led on the N900 usable, and when the right patterns are enabled from the Settings, the LED patterns should start to work. Soon we'll be able to close issue #186. Various fixes to dsme made a difference, and in some cases, now allow for clean shutdown and reboot. However, more work seems to be required to make it always work reliably. The PowerVR module for the current kernel also has some bugs that prevent clean shutdown. A lot of time has been spent trying to figure out why PowerVR hangs for minutes on startup. In this process, freemangordon wrote a patch to bring the PowerVR up to its proper clock speed, which greatly improves the performance of PowerVR in general, but this unfortunately does not fix the slowness/hang on startup. More investigation will be required to fix the temporary hang on start. Working voice calls is still work in progress, see Issue #77.
freemangordon has been doing more work on connui, to make it feasible to implement the ofono/data plugin for icd2. Apart from a plugin icd2, there's more work required, as we'll have to implement or replace various dbus interfaces that Fremantle offers. The next step will be to make an overview of all the work that needs to be done, and then start picking up the tasks one by one. We're working on a way to make testing and installing Maemo Leste easier than the current procedure - which involves installing and updating Maemo Fremantle before running Maemo Leste. Issue 211 covers this in more detail, but our hope is that we can make it so that users can flash u-boot to the device, and then be able to directly boot Fremantle or Leste, or another OS, like postmarketOS. The lima mesa package in our repository is still on Mesa 18.2, while upstream lima has moved to Mesa 18.3. We need to rebuild the latest 18.3 version and check if it still works. This is slightly problematic, because we need the aarch64 version for the Pine64 Anakin Devkit. But perhaps the issue will be gone with mesa 18.3. Someone from the community named PabloPL has made impressive progress with making an Exynos based phone work with mainline, see the current status of mainline plus patches here. The Samsung Galaxy S (i9000) also has a PowerVR GPU, just like the Droid4, so hopefully we can collaborate on making PowerVR better supported on mainline Linux (although the userspace will probably remain closed forever). A lot has happened in the past month and a half, and it's been hard to focus on one specific issue, but nevertheless we've made a lot of progress. Make Leste work on Necunos NC_1 development kit when we get one. At that point, we're almost ready for the first alpha release. We might move the (large) Qt task to a next alpha or beta release. If you're experienced with Qt, we would definitely use the help! Finally, if you have a spare device that we already support, there may be developers who would be very happy to recieve it by post and make Maemo Leste work (even) better! We now have a couple of spare Motorola Droid 4 devices that we can give to developers who want to work on phone calls and/or PowerVR support. If you have a spare Nexus 5 or Nokia N900, those might turn out to be quite helpful as well.